FUNCHAL (PORTUGAL), 1 July 2009 – A demanding stage of three back to back races will end this weekend as the FIM Motocross World Championship heads to Uddevalla, Sweden, for the 11th Grand Prix of 15. Cairoli has a strong lead in the MX1 class with new runner up Nagl and Philippaerts following. In the MX2 class there is Musquin on top with Paulin and Goncalves completing the top three. Winning his second consecutive GP at Kegums Yamaha Red Bull De Carli’s Cairoli is ready to enter the Swedish Grand Prix on top of his game. The Italian heads the MX1 Championship at his first full season in the category and has already taken four Grand Prix victories while the second winningest rider Barragan has two despite five MX1 seasons under his belt – including 2009. Cairoli’s performance in Latvia left other youngster Desalle of LS Motors Honda with a disappointed second, though the Belgian collected his maiden moto win at the end of the opening heat. Desalle, whose defeat was also due to a clutch issue in moto two, will surely give it another try this weekend in Sweden to improve on his fifth position in the Championship, just 19 points behind new runner up Nagl. The German of Red Bull KTM Factory Racing struggled in the second Latvian heat but managed to move past defending Champion Philippaerts in the points standings. The latter dropped down to third ahead of Yamaha Monster Energy Motocross team mate Coppins, coming back to the podium at Kegums after two strong rides. Leaving Cairoli aside, the group of riders spread from second to sixth in the Championship are spread in just 30 points as this list also includes Teka Suzuki WMX1’s De Dycker, whose Latvian GP was hampered by a first moto crash. 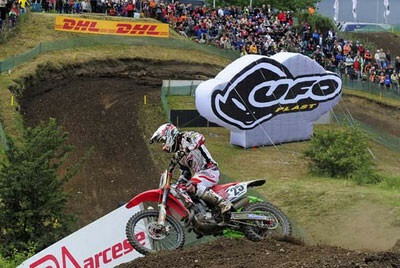 Sweden is a milestone venue for De Dycker taking his maiden overall win at Uddevalla in 2007. With the fans expecting Barragan’s return to action after his Swedish GP win of last year, they will have to wait one more round as the Spaniard is due to comeback at Lommel together with team mate Krestinov. Home rider Johan Carlsson of Delta Rentor Racing Team will try and improve on his 32nd place in the points standings by exploiting the advantage of racing at home while American Matt Boni will jump onboard the Factory 450 Honda seat left vacant by injured Billy Mackenzie of CAS Honda. With the Swedish GP being the closest to his home country Norway, GP winner Gundersen will reinforce Yamaha’s line up this weekend as a wild card rider. In 2008 Gundersen entered his 12th FIM World Championship season with the Utag-Yamaha.com squad but a knee injury at the opening GP in Valkenswaard saw him pull out of the whole GP campaign. More photos available at www.motocrossmx1.com/galleryinfo.aspx. Returning to victory onboard his Red Bull KTM Factory Racing machine in superb Latvian weekend, Goncalves is confident for Uddevalla. With three GP wins now in his bag courtesy of Kegums’ success, the Portuguese stormed to third in the Championship to put runner up Paulin in his sights. The goal will keep Goncalves busy in the forthcoming weekend with the Portuguese expected to try and close the 21 point gap from the Frenchman. Championship leader Musquin watches the dogfight for second being 49 point ahead of Paulin. Courtesy of a second overall finish, the KTM mounted Frenchman took his fourth consecutive podium at Kegums where he collected as many points as overall winner Goncalves and limited the damages to his solid Championship. Kawasaki Bud Racing PSM’s Paulin completed the podium in Latvia with the country marking both his podium comeback –after an absence of two races- and the maiden appearance of the series in the country. Guarneri of Yamaha Monster Energy Ricci Motocross just dropped from third to fourth in the Championship rounding off a packed top four. CLS’ Frossard is fifth ahead of rookie Roczen. The Teka Suzuki Europe World MX2 boy, who won already at Teutschenthal, is a surprising sixth in the Championship with a 64 point gap to close if he wants to break into the top five as he is currently sandwiched in between French countrymen Frossard and Aubin. Saturday: WMX Free Practice 9:00-9:30; MX2 Free Practice 10:00-10:40; MX1 Free Practice 10:50-11:30; WMX Time Practice 12:00-12:30; MX2 Pre Qualifying Practice 13:30-14:10; MX1 Pre Qualifying Practice 14:30-15:10; MX2 Qualifying Race 16:00; MX1 Qualifying Race 17:00; WMX Race 1 18:00. Sunday: WMX Warm Up 8:45-9:05; MX2 Warm Up 9:15-9:35; MX1 Warm Up 9:45-10:05; WMX Race 2 11:15; MX2 Grand Prix Race 1 12:10; MX1 Grand Prix Race 1 13:10; MX2 Grand Prix Race 2 15:03; MX1 Grand Prix Race 2 16:03. Freecaster.tv is the prime source of LIVE and On-Demand coverage for action sports on the Internet. Watch the 2009 FIM MX1/MX2/MX3 and Women’s World Championships, the 2009 SuperMoto World Championship and the 2009 FIM Snowcross World Championship races exclusively, LIVE and free on www.freecaster.tv. Youthstream is the company that manages the exclusive television, marketing and promotional world wide rights of the FIM Motocross World Championship, the FIM Motocross of Nations, the FIM Women's Motocross World Championship, the FIM Veteran's Motocross World Cup, the FIM Junior Motocross World Championship, the FIM SuperMoto World Championship, the FIM SuperMoto of Nations, the FIM Snowcross World Championship, the UEM Motocross European Championship, the UEM Motocross of European Nations and the UEM SuperMoto European Championship.